Successfully Added 7 Inch Touchscreen GPS Navigator and DVR (4GB, Bluetooth, FM Transmitter) to your Shopping Cart. 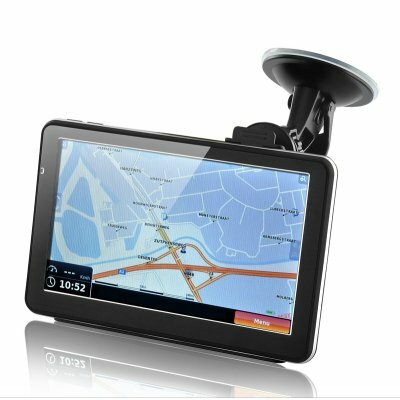 7 Inch Touchscreen GPS Navigator with DVR which lets you get to your destination effortlessly, record videos for memory or insurance purpose, and comes with rich multimedia features to keep you entertained. This wide screen GPS navigator supports spoken voice directions, automatic route re-calculation and even speed limit alarm and road speed alerts that lets you find your way more easily. The Bluetooth function allows you to pair your mobile phone with the GPS and make phone calls hands free. Your driving is safer with this product, which means you and your family or other passengers can relax more and enjoy the journey. The build-in car video recorder enables you to easily capture video of road situations in VGA quality. The applications are boundless: insurance purposes, court evidence, capturing an officer’s abusive behavior or just plain fun. This is the only portable GPS navigator on the market that comes with DVR function! Aside from playing the web's hottest audio and video file formats like MP3 music as well as MP4 movies and TV shows, you can also enjoy reading your favorite books and playing some fun games on this GPS navigator. With direct WINCE access, you can even made a few edits to your Word, Excel, or PPT files while waiting for the green traffic light. Available in single piece or bulk orders, this 7 inch GPS Navigator and DVR is ready to be shipped out immediately. Buy one to see how great it is and then buy a bunch for your online store. We can even dropship directly to your customers and they'll think it came from you. Chinavasion - the online leaders in direct from China wholesale electronics. Special GPS Note: This model is compatible with most brands of GPS software, such as TomTom, iGO, Route66 etc. - however hardware specific software such as Garmin may not run on this unit. As the wholesaler, Chinavasion provides the GPS-enabled hardware only, not the software. Chinavasion provides no warranty or customer support regarding GPS software. Chinavasion cannot provide downloads , links , advice regarding GPS software. Any software installation you undertake should be performed or supervised by a professional. To view the recorded videos, please download the files and watch on your computer. Playback on the navigator might not have sound.